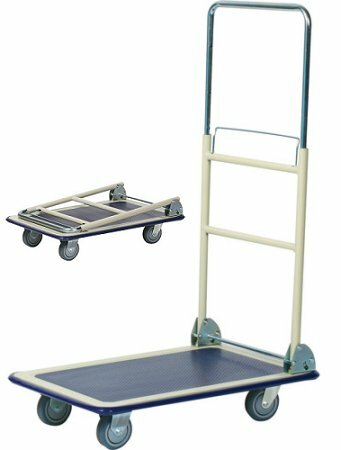 4 position handle height adjustment provides stops at 32", 37", 41" and 44"
The Wesco Folding Handle Platform Cart has a telecoping handle to meet your transporting needs. 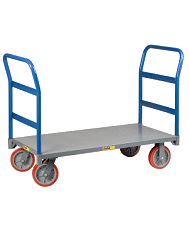 Four handle heights make it easy to you transport small to large loads with the ease of a push lever. Various handle heights also elminate the need to bend to push the cart making it easier on your back. Get your Wesco Telescoping Handle Cart today and save your back. The biggest time saver! I exhibit at many craft shows and fairs during the summer and getting my displays and product to my set up site takes the most amount of time. This little cart has been a huge time saver. It can hold several containers of my product and cuts down on the number of trips I have to make. Also, because it's very compact when folded up it takes up little room in my vehicle.